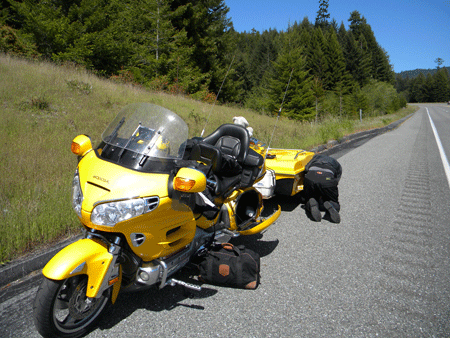 The Grand Tour with the Rose City Motorcycle Club was the inspiration for this trip. And we added a few stops along the way. The first day was dry and cloudy. We ran south on I-5 for two hours and turned right to the south Oregon coast. There we turned east up the Rogue River on a narrow, rough, mostly 2-lane road. It had not had it's spring maintenance and had lots of sharp pointed rocks that had rolled down the bank and onto the road. I tried to miss them with all the tires and was mostly successful. Then we arrived at Agness, a checkpoint on the Grand Tour. This, plus the post office, is Agness. It supports the local fishing resorts and hill folks. After running back down the 32 miles of narrow, rock strewn windy road we were back on Highway 101 along the coast and headed for California. When one enters California one has to stop at a border station and answer the officer on whether you have any fresh fruit or vegetables on board. This is a simple, quick stop but is more effort than crossing international borders in most of Europe! We made it across without problem (no fresh veggies or fruit) and continued south. Our next stop was to be in the Redwoods at a campground. But it became along the highway to change a flat on the trailer. We put the spare on and headed for Eureka. I think we had bruised or split the cords on the tire and a bubble formed that quickly wore thru. We now had a blown out tire, a nearly worn out tire and a half worn tire for the trailer. Obviously we needed some new rubber soon. 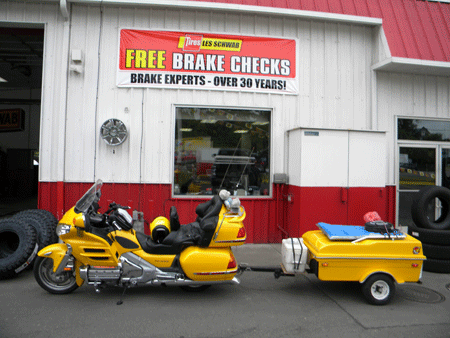 Our next stop was at Les Schwab, a large tire dealership with a good reputation in the NW USA. We bought three new tires. But the Eureka dealer had only one. The dealer in Fortuna had two more. 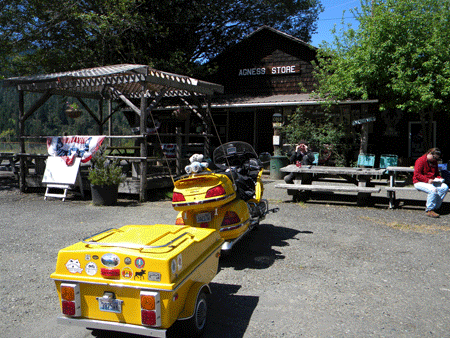 So we took the one in Eureka and headed south to Fortuna and left the trailer with them while we went to dinner. 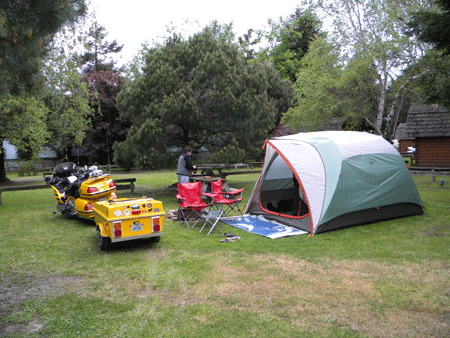 Along the way to the Eel River Brewing brewpub we saw a campground. So after dinner while I went back and got the trailer, Kathy checked us in for the night. 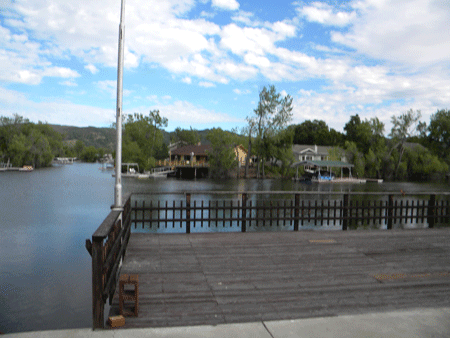 The Riverwalk Campground is one of the nicest we have ever stayed in. And we found it by luck not skill. The tent sites are large and grass covered. The staff is friendly and the restrooms are very clean. The highway is far enough away for it to be quiet in the campground. We highly recommend them. 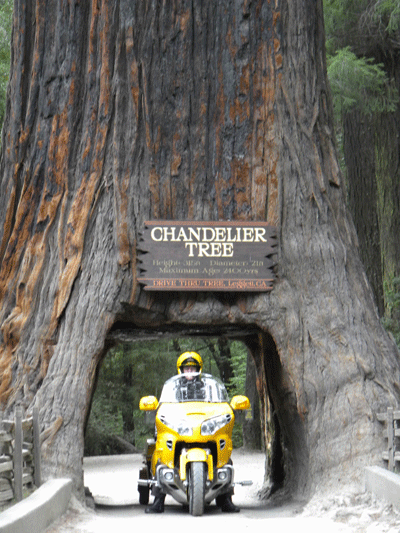 The next day, all rested and ready we head into the Redwoods and the famous Drive Thru Chandelier Tree. This is in a private, pay to get in, park. But it is one of those things one must do if in the Redwoods. It is near the town of Leggett. After a walk through the gift shop we headed out of town and west on Highway 1. This is one of the most scenic roads on the west coast. 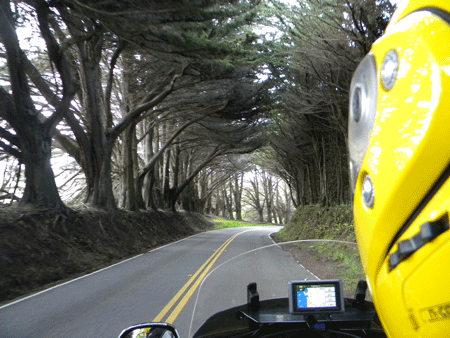 It follows a very, very curvy route to the coast and then south along the coast to our next check point at Point Arena. 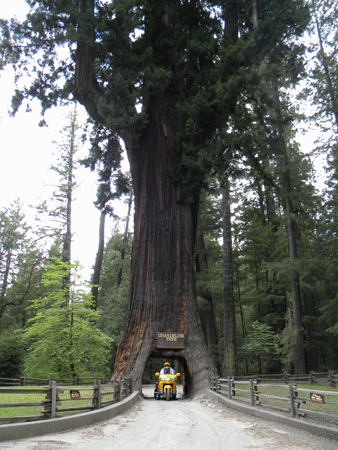 Along the route are tunnels of Cypress or Eucalyptus trees. The coast is rocky and windswept, like the south Oregon coast. After lunch at the Rollerville Cafe, the checkpoint, we turned east and follow a county road up, and up, and over the coast range. This road was even curvier than the start of Highway 1, and in many places was less than two lanes wide. The occasional on-coming traffic was often big trucks making the sharp, blind, curves very nerve wracking. We are headed to the home of new friends, Don and Debbie. They live on the shore of Clearlake in northern California. Here we will spend two nights and talk about riding, motorcycles, beer, and Europe. They are going to Europe next year for some riding. Today we spent going for a lunch ride around the lake and resting up. That is, us boys went for a ride and the girls stayed home and rested. Riding roads like the one to the right all day without a trailer or passenger is fun! Don led and I tried to keep up for a hundred and thirty miles (just over 200 km). 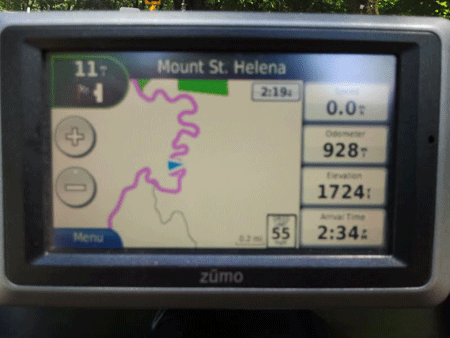 We had lunch at a grill in Calistoga and returned to their house over more of these roads. The sun was out and the hills were green with new spring growth. It was a good day! Tomorrow we head on south for Yosemite NP and another checkpoint.